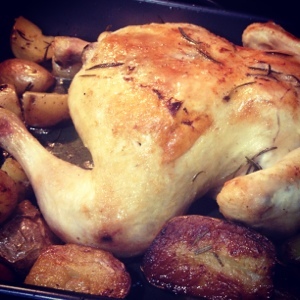 What can be more delicious than a roasted chicken and potatoes? This dish is particularly flavorful because potatoes are cooked in the chicken drippings which infuses them with a rich taste. My husband compared these potatoes to duck fat fries we hadnout recently. High compliment in my book!!! In a bowl, combine oil, herbs, salt and pepper. In a deep baking dish, toss the potatoes w half the oil mixture. Place chicken breast down over the potatoes. Roast for 20 minutes, shaking pan occasionally so potatoes don't stick. After 20 minutes, baste with oil from bottom of pan. Roast another 10 minutes. At this point, breast should be beginning to brown. Reduce temperature to 350. Toss potatoes w remaining oil mixture, flip chicken breast side up and baste. Continue to roast, basting occasionally till internal temperature is 155F, about another 30-40 minutes. At this point, the potatoes should be cooked and crisp on the outside, soft on the inside. If you wish, remove the chicken, up the oven temp to 425 and roast the potatoes another 5-10 minutes. I served chicken and potatoes with fava beans.